Short Hills, NJ - Investors Bank is introducing the New Jersey Devils Checking account, giving loyal fans the opportunity to show their team pride and spirit whenever they use their debit cards or write checks. Investors Bank is the team’s official bank partner and now is the perfect time to open a New Jersey Devils Checking account. The New Jersey Devils Checking account comes with many exclusive features. 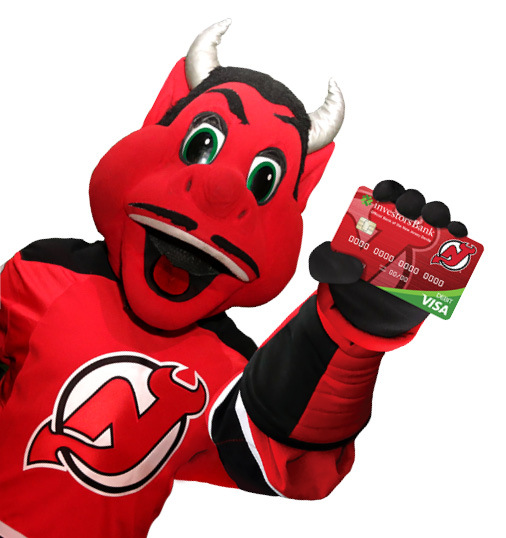 Anyone who opens a New Jersey Devils Checking account will receive a New Jersey Devils-branded debit card, checks and checkbook. Additionally, each time a customer uses their New Jersey Devils Checking account or debit card, they will be eligible to earn rewards like tickets to New Jersey Devils home games at the Prudential Center, New Jersey Devils merchandise and invites to select fan events. A customer can open a New Jersey Devils Checking account with a minimum deposit of $50. Investors Bank is also offering its New Jersey Devils Checking account customers an opportunity to get the newly designed 2017/2018 New Jersey Devils team jersey free of charge. This opportunity is available to any customer who simply opens a New Jersey Devils Checking account and sets up a minimum $500 recurring direct deposit. The supply of these jerseys is limited and available on a first-come, first-served basis, while the supplies last. The New Jersey Devils Checking account will also provide customers with comprehensive identity protection, including fraud expense reimbursement, debit card registration, 3-in-1 credit file monitoring, 3-in-1 credit reports and total identity monitoring. Also, the New Jersey Devils Checking account comes with Cellular Telephone Protection®. Under the Cellular Telephone Protection plan, customers can receive up to $300 to cover replacement or repair costs if a cell phone is stolen or damaged in the U.S. or in a foreign country. Customers may refer to Investors Bank’s Guide to Benefits for complete details about this plan. Registration or activation fees may be required for certain benefits. Investors Bank is promoting the New Jersey Devils Checking account with advertising throughout the Prudential Center, in addition to a television commercial that will run on MSG Network. The television commercial will feature Cory Schneider, the goalie of the New Jersey Devils. Fans can visit any of Investors Bank’s more than 150 branches to open their New Jersey Devils Checking accounts. New Jersey Devils Goalkeeper Cory Schneider said, “First, I’m very grateful that Investors truly supports the Cory’s Keepers program. We've worked together to bring many young fans to our games, who may not otherwise be able to attend. Additionally, I'm really excited about working with Investors on the Devils Checking account. We had a great time filming the commercial and we hope that shows. It's great that fans can show their support outside of the rink and earn great Devils prizes. As the season gets underway, it's exciting to be able to work with great partners like Investors."